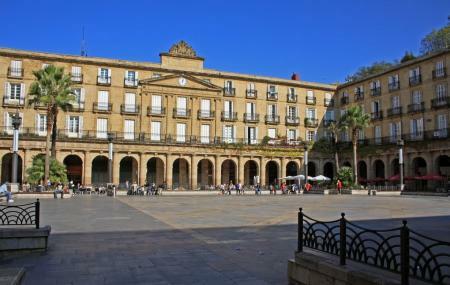 Built in 1821, the Plaza Nueva is a monumental square, an architectural feature which is a part of many Spanish towns. It’s design is neoclassical and it used to be an official building of the Biscay government but now is home to the Basque language Royal Academy. The square has a number of bars and bistros where any visitor can enjoy a pleasant evening. Gift and souvenir shops are also here for the delight of tourists visiting the areas. A number of people visit the area just to have a relaxing time out on this open. This is a place where you will really feel the true pulse of the city of Bilbao and its people. A number of traditional taverns and restaurants are here which are not that expensive but can give you quite the gastronomic experience. The space is used for a flea market every Sunday where books, coins, stamps and all kinds of other items are sold. The space is also used during festivals, concerts and folk demonstrations. You can just sit back and relax out in the open without visiting the restaurants as it is open 24X7. July and August on average are warmer and the most pleasant times to visit. You might want to avoid going to the Plaza when it rains. You should try the tapas bars for some local cuisine and wine. It is bustling with activity during the weekends, so if you like peace and quiet, a visit on a weekday is a must. Recommended time to visit at 5 pm. The restaurants mostly close around 11 pm so keep that in mind while visiting. Tram: line Atxuri, Basurto, stop Arriaga. Metro: line Lezama, stop Casco Viejo Bilbao. Bus: line A2, A5, stop San Nicolás 4. How popular is Plaza Nueva? People normally club together Basilica Of Begona and Casco Viejo while planning their visit to Plaza Nueva. VEry traditional place in Bilbao, also a very touristy place in Bilbao. It is a nice inner courtyard with plenty of small bars and restaurants all around. It is a good place both for a formal sit-down meal as well as for only a drink and a small snack. It is a nice place to sit down and have some pintxos. We were at Charly and enjoyed it. Also you can go to Bilbao restaurant if you prefer a menu.